Marion Walker obtained her BMus.Ed with Merit (*see note) from the Sydney Conservatorium of Music in 1991. Graduates from this course are four year trained teachers, qualified to teach music from K-12. *Note - "An award 'with merit' may be conferred upon a student who has a record of outstanding achievement throughout the course in which the student is enrolled." Sydney Conservatorium Handbook 1990 p.52. From 1987-1997 Marion operated a private Violin studio in Sydney and also worked at the Sydney Opera House (from 1993-1997), in the Dennis Wolanksi Library of the Performing Arts. 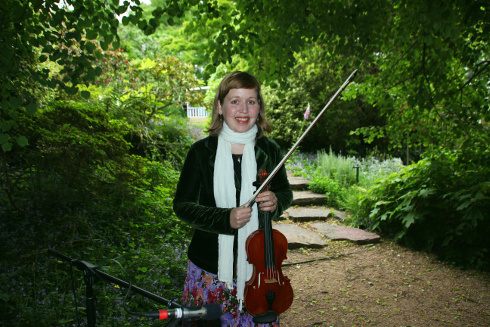 In the latter half of 1997 Marion moved to the Blue Mountains and worked as a Violin teacher at the Penrith Conservatorium of Music during 1998 and 1999. She also worked at the Blue Mountains Conservatorium (now Grammar Music Academy) from 1998 to June 2001 as a teacher of Violin and Early Childhood Music. Since July 2001 Marion has managed her own music studio in Blackheath and offers tuition in Violin and Early Childhood Music. She also provides performance opportunities and ensemble skills for Violin students in the Singing Strings Orchestra. All levels of Violin are taught and students are prepared for AMEB exams as required. For a number of years, Marion has also prepared students for the annual Sydney Opera House String Festival. From 2009 - 2012 Marion was the Violin teacher at Kindlehill school, Wentworth Falls. Marion has also directed the Blackheath Public School Violin Ensemble since 2007. Marion believes in broad musical education and she provides her students with music to play from a wide range of genres including classical, folk and popular music. Marion is also an experienced arranger and composer and is able to cater to students of all abilities through her musical works. Students are also encouraged to compose their own pieces and Marion is currently compiling a book of student compositions. The Early Childhood Music program has been uniquely designed by Marion to introduce pre-school aged children to all the basic musical concepts through playing tuned and untuned percussion, keyboard, recorder, singing, dancing, and composing. Elements of Kodaly, Suzuki, and Dalcroze methods are incorporated into these enjoyable classes. As well as her teaching commitments, Marion currently performs as Violinist with Dolce Duo, providing musical accompaniment at weddings and other functions throughout the Blue Mountains.